EPFL scientists have identified two enzymes that protect chromosomes from oxidative damage and shortening. Blocking them might be a new anticancer strategy for stopping telomerase, the enzyme that immortalizes tumors. Before cell division, the long strings of the cell's DNA are wrapped tightly into chromosomes. This protects the cell's genetic material from physical and chemical damage. The ends of chromosomes are called telomeres. These are specialized structures that have to be replicated with each cell division cycle. But the complete replication of telomeres up to the very ends of chromosomes also requires specialized mechanisms, and these are limited. Telomeres are also very sensitive to oxidative damage, which affects their ability to replicate. Now, Joachim Lingner and Wareed Ahmed at EPFL have discovered two antioxidant enzymes that work together to prevent oxidation of telomeric DNA at chromosome ends. 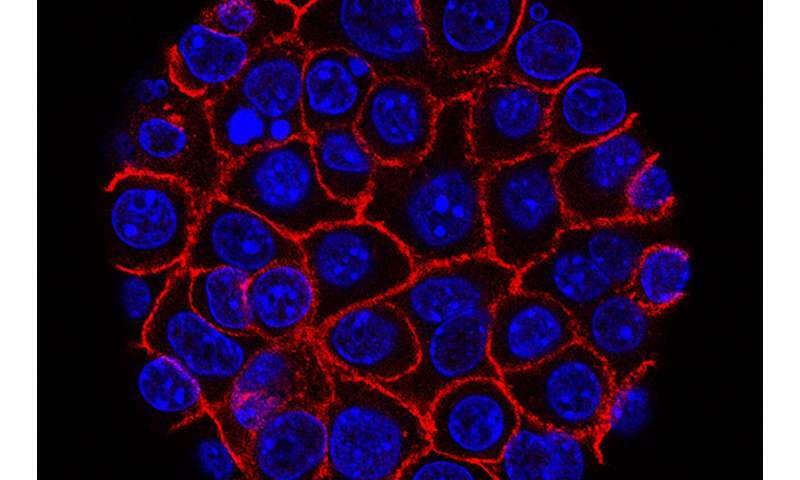 The scientists disrupted both the enzymes, called PRDX1 and MTH1, in cancer cells, and found that the cells' telomeres shrunk with every round of cell division, eventually disappearing altogether. One promising target in cancer therapy is the enzyme telomerase. Normally, telomerase prevents telomeres from shortening in germ and stem cells, which helps with development. But telomerase is also highly active in cancer cells, keeping their telomeres intact and making the cells virtually immortal. The new work shows that disrupting PRDX1 and MTH1 prevents telomerase from counteracting telomere shortening. So far, attempts to efficiently block telomerase in cancer have not been fruitful in the clinic. The discovery of the co-operating enzymes opens up a new opportunity to indirectly block telomerase. "Instead of inhibiting the enzyme itself, we target its substrate—the chromosome end—making it un-extendable by telomerase," says Lingner.